Home » Starting BJJ » Should I get in shape before joining a BJJ school? Should I get in shape before joining a BJJ school? No, you should do BJJ to get in shape! If you told me “I want to get in shape so I can ride a bike,” I’d tell you “You ride a bike to get in shape!” The same is true for BJJ. Doing an activity is the best way to get in shape for it. “Getting in shape first” is a very common excuse for not starting BJJ sooner, and it is usually hiding the real fear: being afraid of embarrassing yourself and looking foolish in front of others. This fear is common, as is its sibling: wanting to be good without ever doing something before. I’ll ruin the suspense right now and let you know that even people who are in shape have trouble starting BJJ. You also won’t be good at BJJ without ever doing it, no matter how many UFC Fight Nights you’ve watched. To be honest, I’ve never seen someone who could legitimately say they needed to get in shape before starting BJJ. They would need to be so morbidly obese or frail that a doctor would tell them not to. They have bigger problems than “getting in shape” if that’s the state their life’s in. Learning BJJ techniques and sparring against people is a very fun, interesting and exciting way to get in shape. It beats running on a treadmill while listening to your Ke$ha playlist, or being that creepy guy who lift weights in his garage with the door rolled up. Joining a BJJ school and becoming surrounded by teammates can be very motivating. You’ll quickly make friends who want to see you get better. At a gym with a good culture, the benefits of doing a social activity will quickly outweigh the potential for social anxiety. Another common fear is that you’ll be so out of shape and so bad at BJJ that you’ll be wasting your instructor’s and training partners’ time. 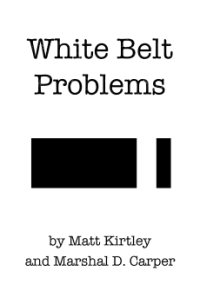 This fear comes from not understanding that an instructor’s job is to help you when you are out of shape and clueless, and everyone else will understand because they were bumbling white belts like you at some point. A good BJJ instructor will account for your physical fitness, be patient and encouraging, and push you without killing you (okay, they may kill you a bit, but that’s good). If you’ve thought of doing BJJ, stop making excuses, find a gym, sign up for a free class and stick with it long enough to really tell if it’s right for you. That could take 3-6 months or longer! As a white belt, I was skinny and out of shape (I’m still skinny, but at least I’m in shape). I was very anxious before every class, and often frustrated by feeling like I wasn’t getting better. But I kept at it, and ten years later, I’m a black belt!